BLOG — What Are The Ten Keys To Wellbeing? The UK New Economics Foundation (NEF) on behalf of the Government, first developed 'Five Ways to Wellbeing' following a major research project looking at people's wellbeing around the world. The project aimed to understand how to improve people's mental wellbeing throughout life. The evidence suggested that a small improvement in wellbeing can help reduce some mental health difficulties and support people to flourish. A detailed report was produced and condensed into five evidence-based actions to support and improve personal wellbeing. 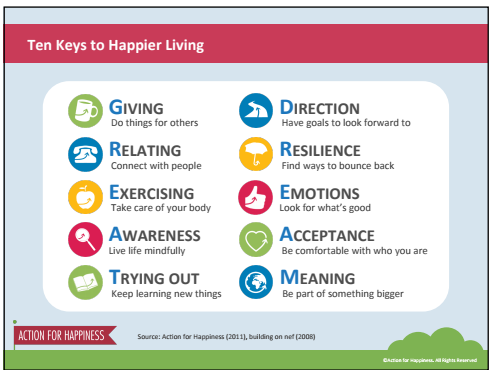 These five keys have a strong focus on how we interact with the outside world in order to promote wellbeing - which led the organisation Action for Happiness to develop a further five keys, which focus on how we cultivate our inner life to foster wellbeing. Soul Stretch works with businesses of all sizes to ensure that the ten wellbeing keys, listed below, are incorporated into wellness programmes, keeping employees motivated to succeed and also helping to enrich their personal lives. Find out more about our approach and the bespoke services we offer. The quality of giving is as important for our own wellbeing as it is for those who receive from us. Giving creates stronger connections between people and helps to create a positive society for everyone. Whether it's through volunteering your skills and experience for a particular cause, lending an ear to someone in difficulty or through financial philanthropy, there are many ways in which we can extend care to another. Relationships are the most significant overall contributor to happiness. People with strong and broad social relationships are happier, healthier and live longer. Close relationships with family and friends provide love, meaning, support and increase our feelings of self worth. Broader networks create a sense of belonging. So taking action to strengthen our relationships and create new connections - even when we’re out of our comfort zones - is essential for wellbeing. Being active has a range of benefits for physical, mental and emotional health and wellbeing. There are simple things that everyone can do to be more active each day, for example walking to work or into town instead of taking the car, starting the day with yoga, or getting a rebounder (brilliant for the lymph system and burns more calories than jogging) and weights to use at home. We can also boost our wellbeing by unplugging regularly from technology and making sure we get enough sleep. Learning to be more mindful and aware can do wonders for our wellbeing in all areas of life, including our relationships, our work-life balance, our connection to our bodies and relationship to things such as food and addictive influences. To help you appreciate the details in life, engage in mindfulness based practices, spend regular time in nature and take plenty of time out to relax and do things that inspire you. Learning affects our wellbeing in a range of positive ways. It helps us gain new skills, potential new work opportunities, exposes us to new ideas and helps us stay curious and engaged. It also gives us a sense of accomplishment and helps boost self-confidence and resilience. There are now countless options for face to face and online learning, many of which are free to access, or are low cost. Many top universities around offer advanced, stimulating online courses, as well as sites such as edX and Udemy.